Category Archives: South Island & family in N.Z. Off to the airport we go. 7.50 am sunrise, colour in the clouds is red, very cold and looks like a snow sky to me. We did all our clean up of the campervan we hired, did all fill ups and returned it on our way to the airport for our flight at 2.45 pm, had to be there 2 hours prior. My cousin met us at the Maui hire center and drive us to airport. By this time it was very cold and icy winds, I said to my cousin just drop us off and get home into the warm house so she did. Got our luggage all wrapped and bags checked in. Our flight was delayed for boarding because of a flat Tyre, we were watching the snow falling onto the tarmac and it’s getting heavier and heavier, I was not feeling very happy about this take off I cant tell you. By the time we did board and seated the amount of snow on the wings, now I;m really feeling uncomfortable, and yes you are right, I do not like flying at all. But it is a great way to get around, so I get on with it. We are sitting down at the end of runway for 1/2 hour to see if the snow was going to ease up, in the end they announced that it was going to get heavier and the flight was aborted, I was so happy :)))) The airline was extremely good to us, they put up the people that were happy to stay back and let families and children take the first available flights, so of course we said go for it, we will wait as long as it takes, so another two days in a motel, all meals paid for and a shuttle back to airport when we need it, we were very grateful. Christchurch, here we come, we hired a wee juicy car and headed back to my cousins, they got a big shock to see us walk in the door. We stayed at the Motel close to the airport and did heaps of tiki-touring around in the snow, was awesome and cold. 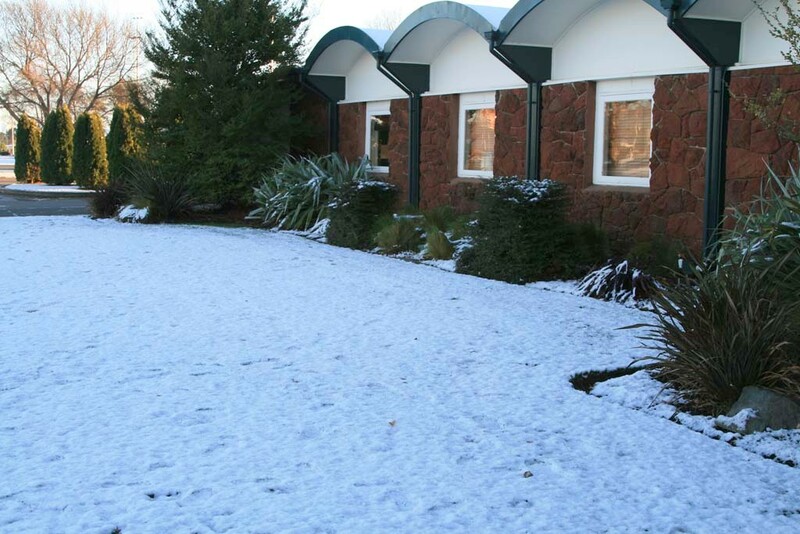 Snow at Suduma Motel Christchurch. 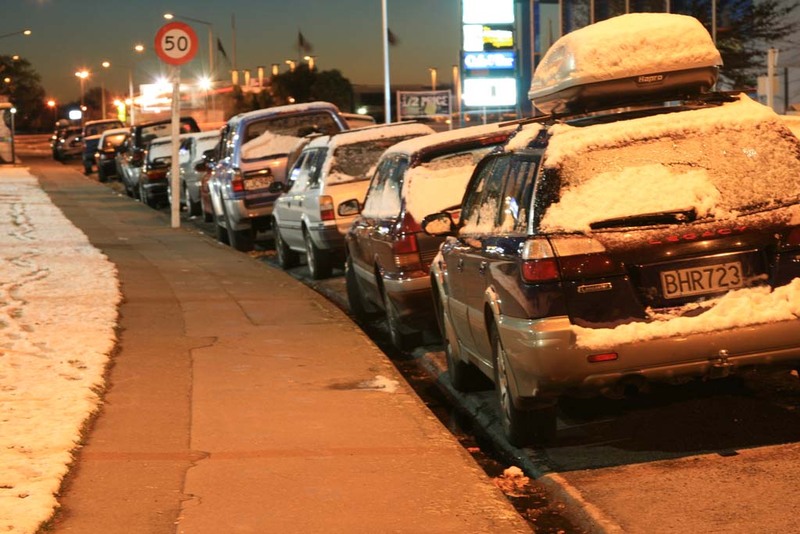 This photo was taken at 11.30 pm out by the Suduma Motel at Christchurch. There has been very heavy falls of snow all around. Port hills had a very good dusting and even down on the beach at Brighton. 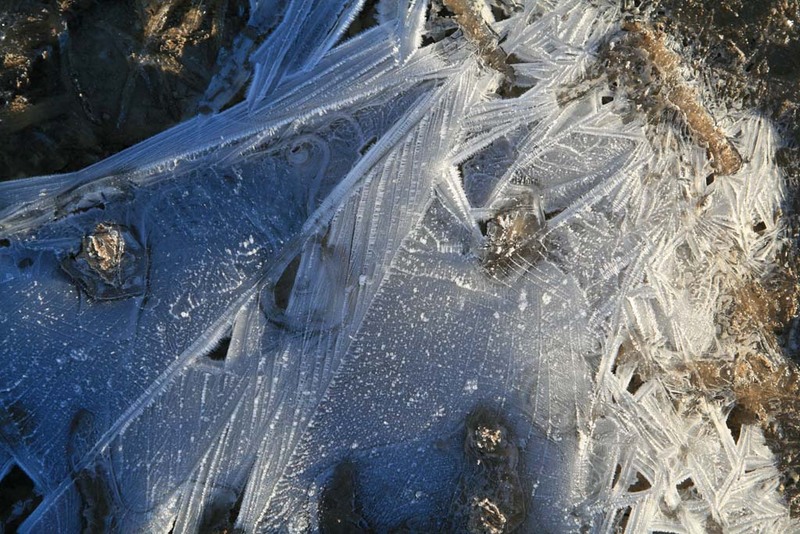 Got up early to head off and take some more photo’s and there is frost on top of snow, amazing patterns. It is very cold and ice on the roads, taking it careful. Caught up this afternoon with all the whanau and had a great evening as we are flying out to Brisbane tomorrow Wednesday 11th. Frost and ice still everywhere but the runway is clear so we will leave as planned today, sorry to be going but wont miss the cold, have had an amazing holiday. Start saving for the next one . Beautiful sight, snow outside the Suduma Airport Motel. 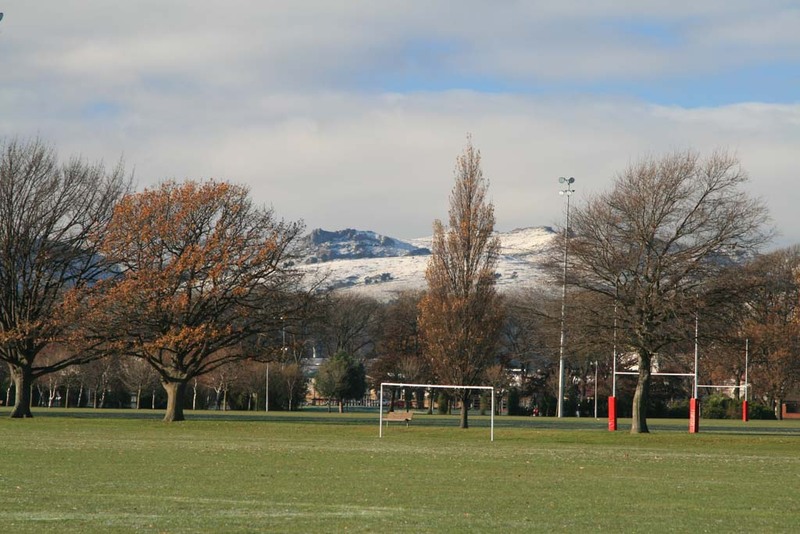 Snow on Port Hills, This is taken from the Hyde Park footy field. Last Leg of our trip. 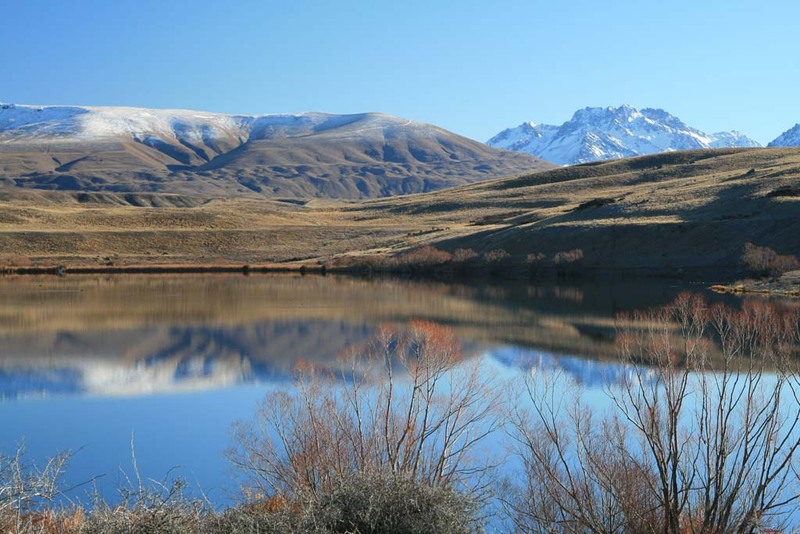 We pushed it last night to get to Raikia Gorge, it was getting dark and there was still frost and ice on the road so with no where to pull off and stay safely we took our time and kept going, got to my cousins place in Christchurch 7 pm. Normally we will not drive after dark, one is because we don’t want to miss out on any scenery and other reason it’s not always the best thing to do. We sat chatting about where and what we had been up to and decided that we’ll go to the Orana Wildlife Park in the morning. We woke up at 8 am did all our morning routine, got lunch packed and took off, my cousin came with us. What a great day we all had. Gates open at 10.30 am and we left as they were shutting the gates at 4 pm, I think we were holding them up a wee bit. Weather was perfect. Cloudy and fine, great for photography. Just love the natural surrounds for the animals, hardly know the big animals are in enclosures, just big paddock and water moats instead of all fences. We got special permission to go with the guy that operates the winch for feeding the Cheetah’s so sitting up on the bank behind him we got straight on photos of the cheetah’s running, and we have since learnt that the main cheetah has since died, so our images of him are very special indeed. We had Chinese for tea and some of the other cousins joined us, what a fabulous day. After tea we all went down to the Brighton Pier, it’s magic at night heaps of colours and they keep changing. 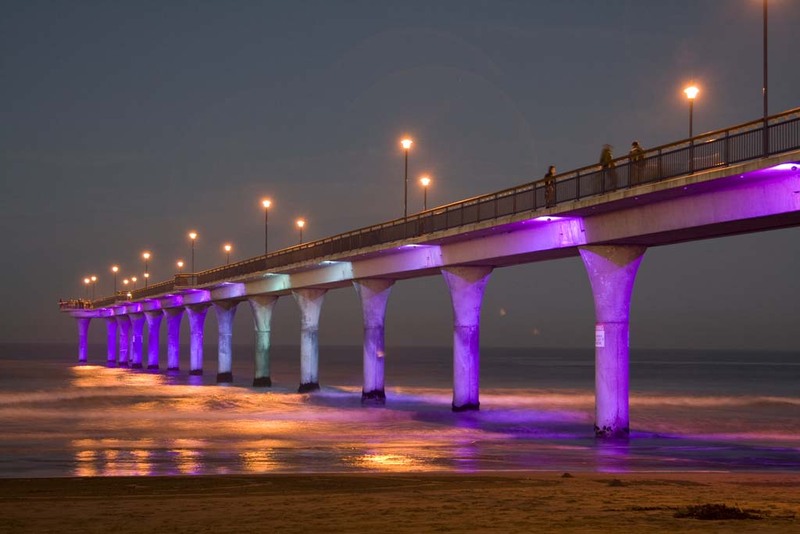 This is the Brighton Pier at night. 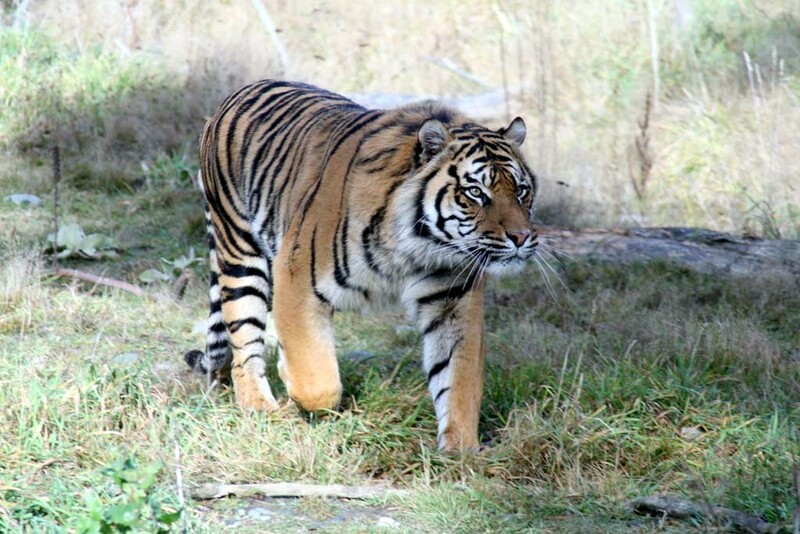 Tiger at Orana Wild life Park. 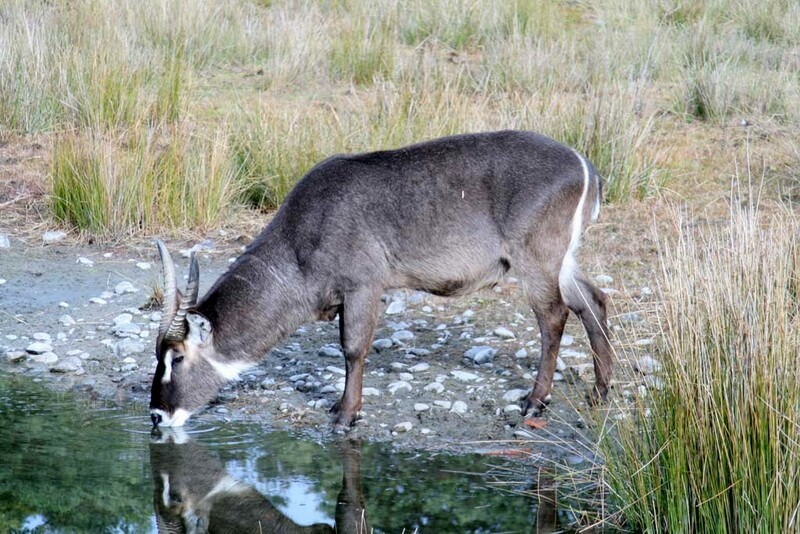 This is a Sable Antelope at the Orana Wildlife Park. 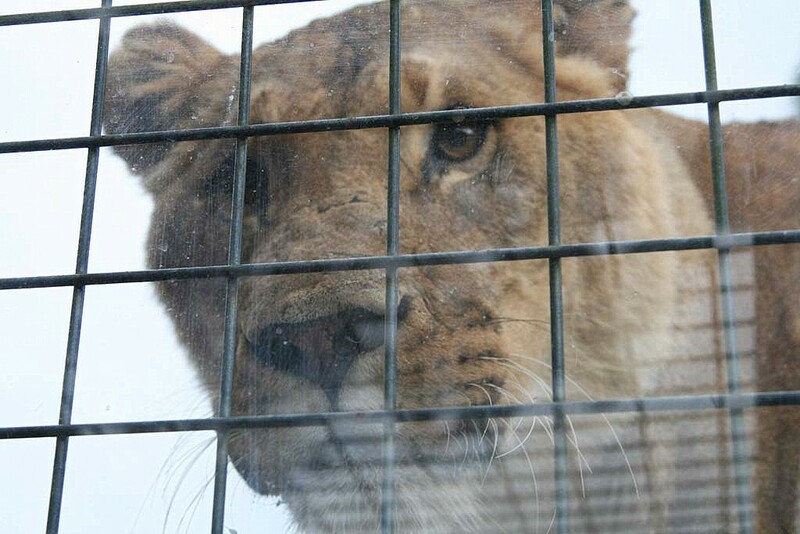 We are in the cage on the back of the truck and the Lions are free roaming, here a Lioness has jumped up onto the truck and is looking at us thru the perspec’s. Orana Wild life Park. Posted in 2008, South Island & family in N.Z. We were up at 6 am for breakfast ready to go up to Lillydale Road to get early morning light on the alps. 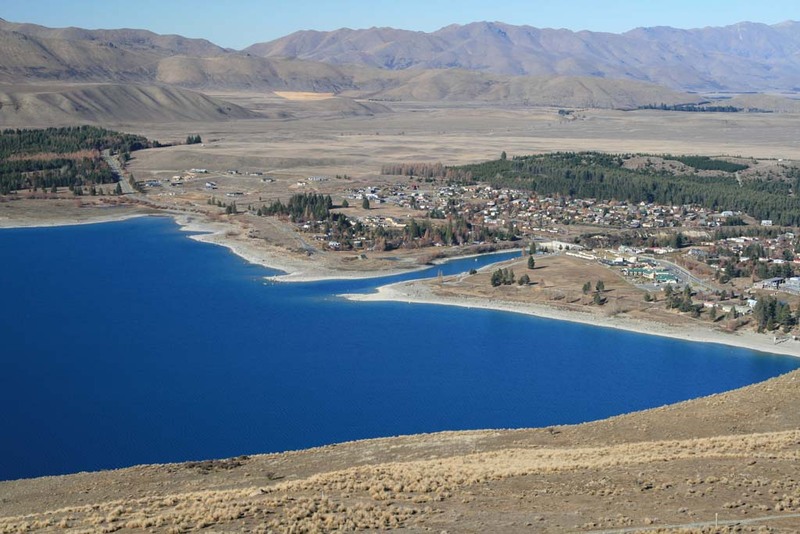 This is across the other side of Lake Tekapo. We were dressed in our snow gear, looked like we were heading to mars, but we kept warm and kept that cold wind out. This is what we were rushing to get, so beautiful, frost on the ground and a slight breeze which is making it real cold. It was great to get the moon in as the first light hits the Alps. We stayed taking photos until the light had become to much and then went around to Mt Johns Conservatory, up there you get a 360 view and when it’s cold like this is best as the air is clear, magnificent sight. From here we went around to see Lake Alexandrena and Lake Gregory, these area are close by and very beautiful, there is good camping there, bird life is good as well. Mountains all around you. This is Lake Gregory. View from Mt John looking down at Tekapo. This was a frozen puddle down at the lakes this morning. Neat patterns. 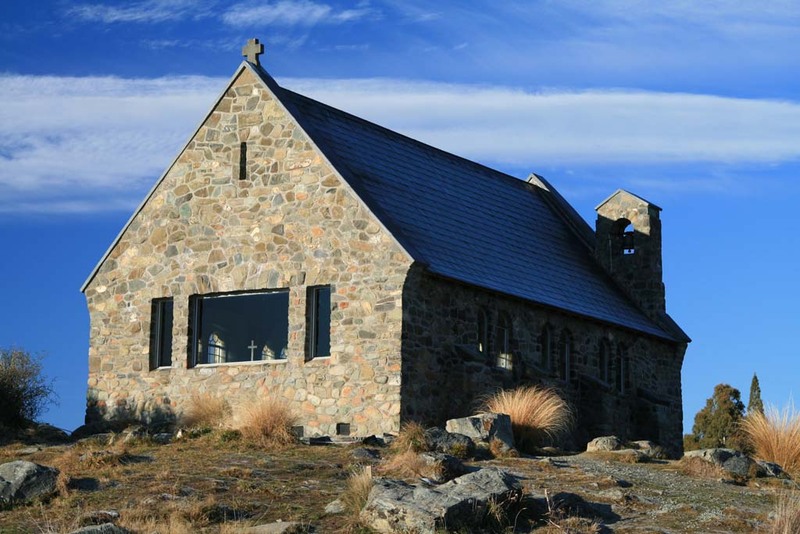 We stopped at Lake Tekapo and had a good look around, got some shots of the Good Shepherd Church and booked into the Van park as we needed power for some heating, bitterly cold night. Got tea done and we were downloading photo’s, we are burning our images onto DVD. Daylight hours are very short 8 am – 5 pm. The park is oldish but clean, not badly priced and the floor is heated in the ladies shower room $2 for a shower. The cold is knocking us around this trip, but still enjoying every moment. The Good Shepherd Church, frost on the shade side of the roof. 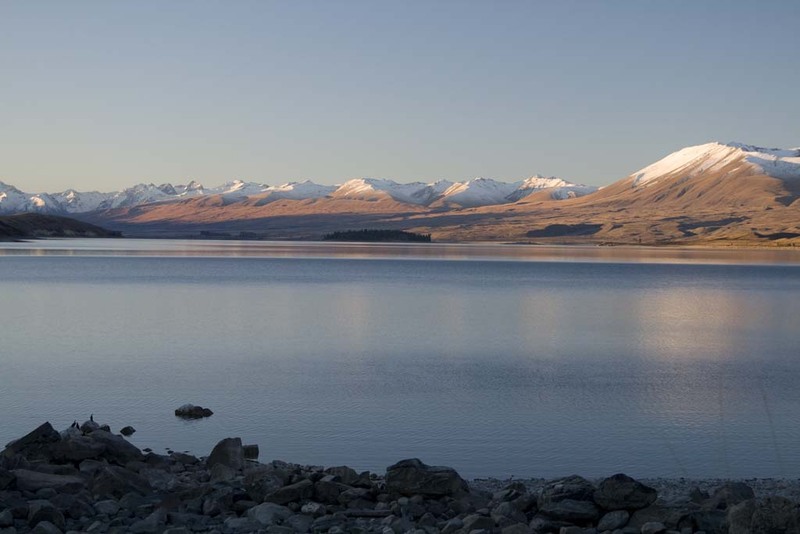 Lake Tekapo, this was taken at late afternoon, sun going down over the horizon. 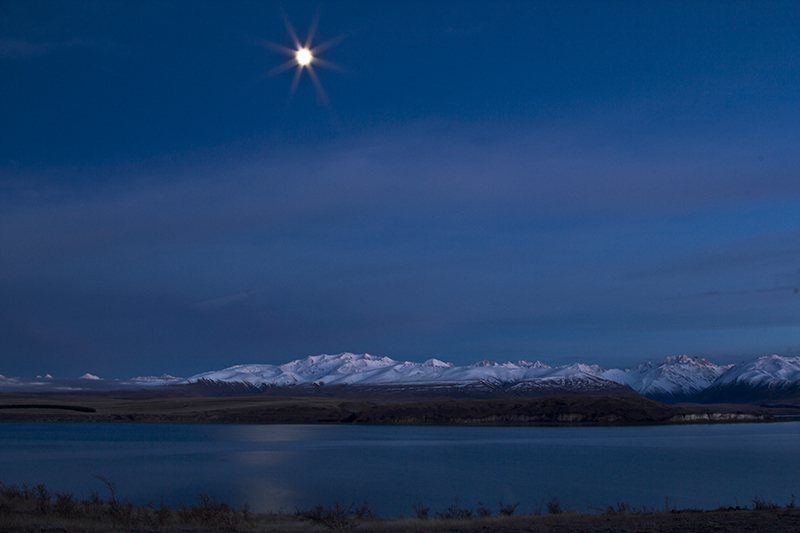 Southern Alps, Looking from the Lillydale road side of Lake Tekapo. Ice and frost on the ground, it’s 11.20 am bitterly cold but the sun is shinning. Snow on most of the tops going through the Lindus Pass, this is amazing country side, big rolling hills, very little vegetation as its always cold and wind swept be hard for any thing to grow, but in saying that, the flowers on the side of the road are incredible at the right time of year. Beautiful colours. All the puddles have thick ice on them, in the shade the wind is nasty. I never tire of this drive each time there is a new beauty that I didn’t see before. 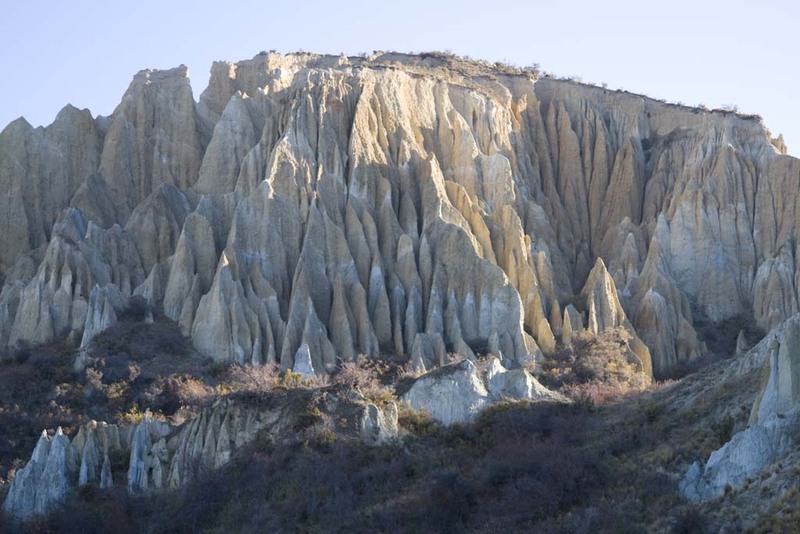 We are heading for Omarama, called into see the Clay Cliffs, lighting is the wrong time of day, it has already gone over the horizon so the cliffs are in shadow, but at least we got to see them. Managed some photo’s. 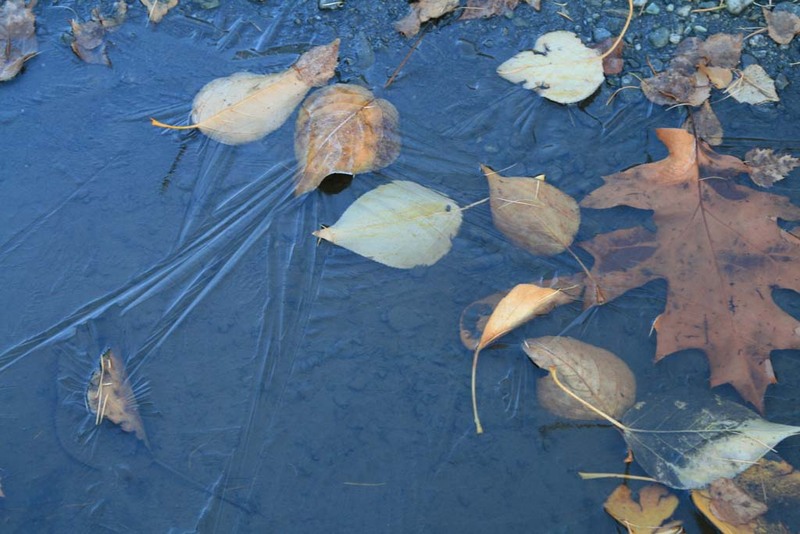 Autumn leaves in the ice puddles. 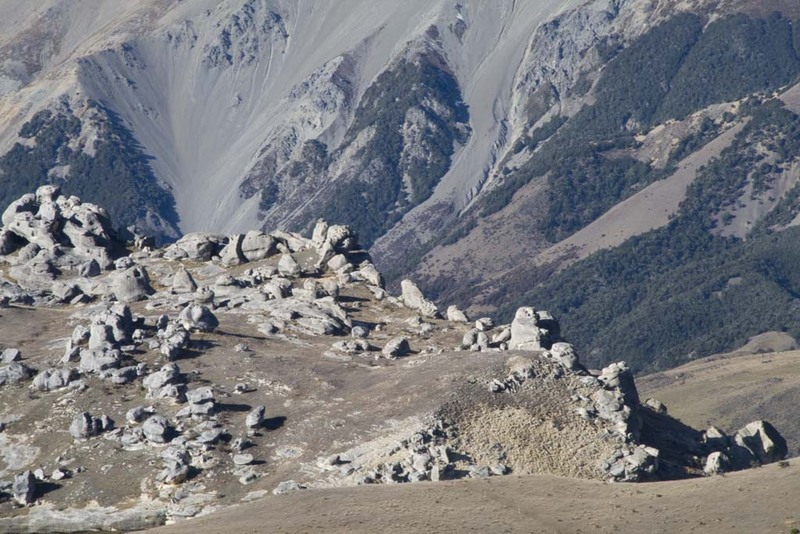 This is the Lindus Pass. 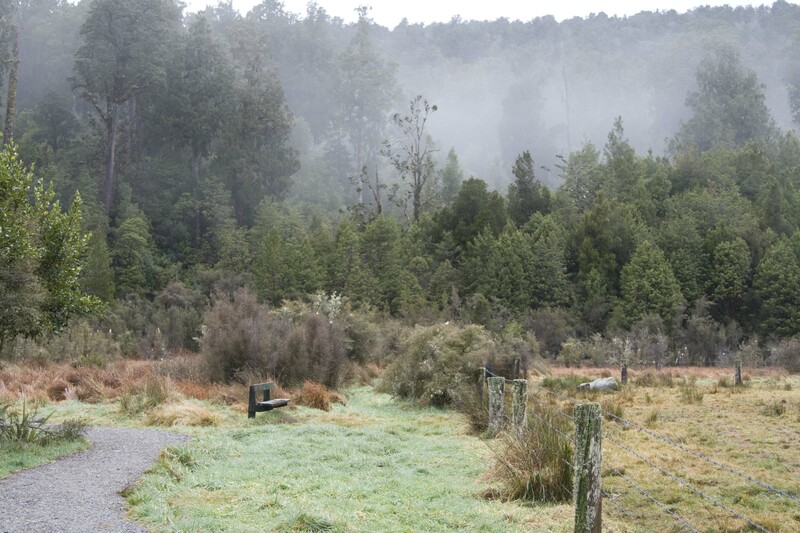 Didn’t get to see the Glaciers as the weather is to bad, very low cloud so we are going to push on down the coast, heading to Haast, see what we can see along the way hoping of course that it stops raining. It wasn’t to far and it did stop raining and cloud lifted as the day went on, we can live with overcast not a problem. By the time we got to Ship Creek it wasn’t to bad so we stopped, just love this place, the beach is usually full of drift wood all shapes and size’s. The sea is always rough being on the west. Makes for nice photography. 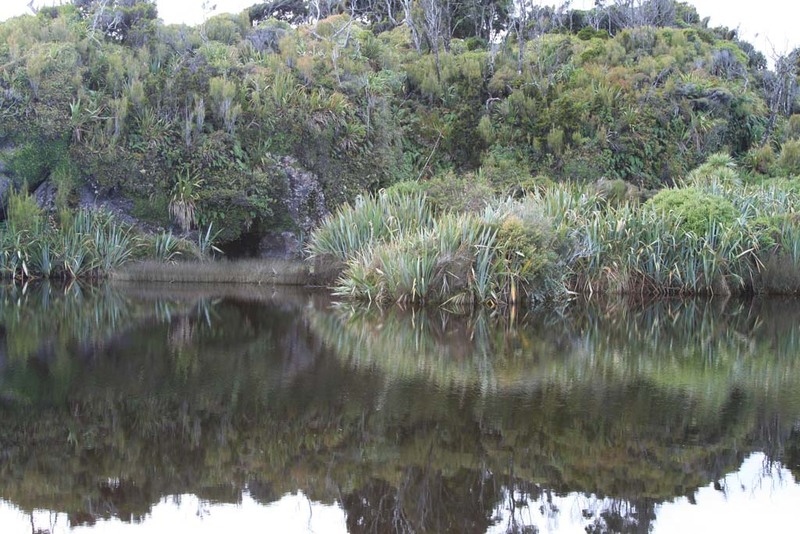 This is what the area is like, pools of water with perfect reflections, the fauna is native and beautiful. The trees in the back ground are called kahitkatea native to NZ. 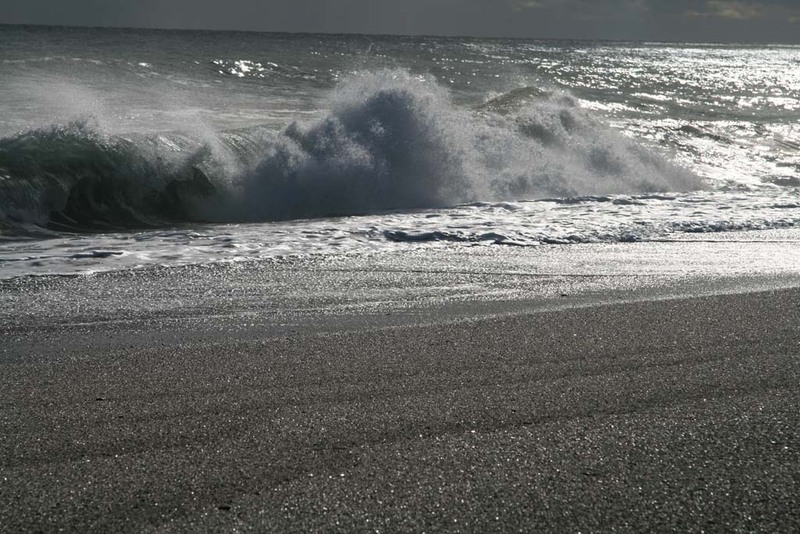 This is how the beach is and I feel this is quiet calm today. From here we carried on down to Haast and the weather is turning again to rain so decided to get as far as we could hoping for Hawea over the Haast Pass. Saw some of the waterfall’s but just not good for photo’s. 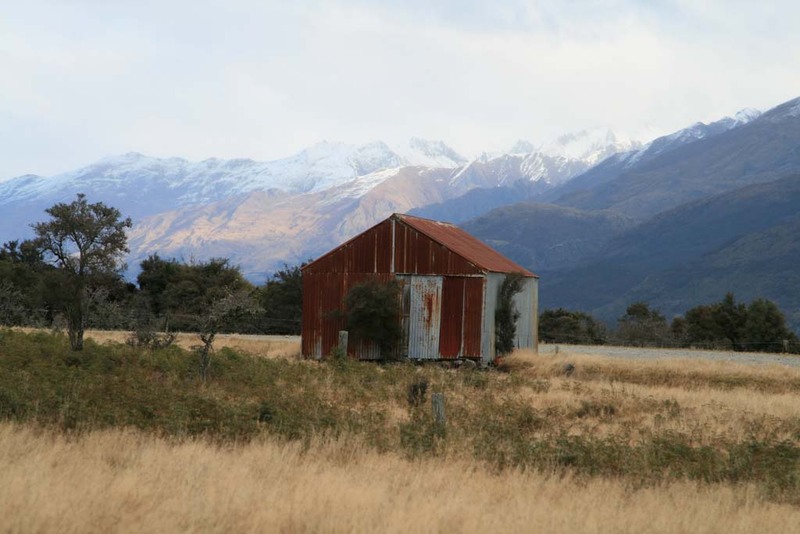 As we were travelling along through Makaroa it started snowing behind us as you can see in the image below. This old shed is just down from the image above, a wee bit of sunlight coming through. 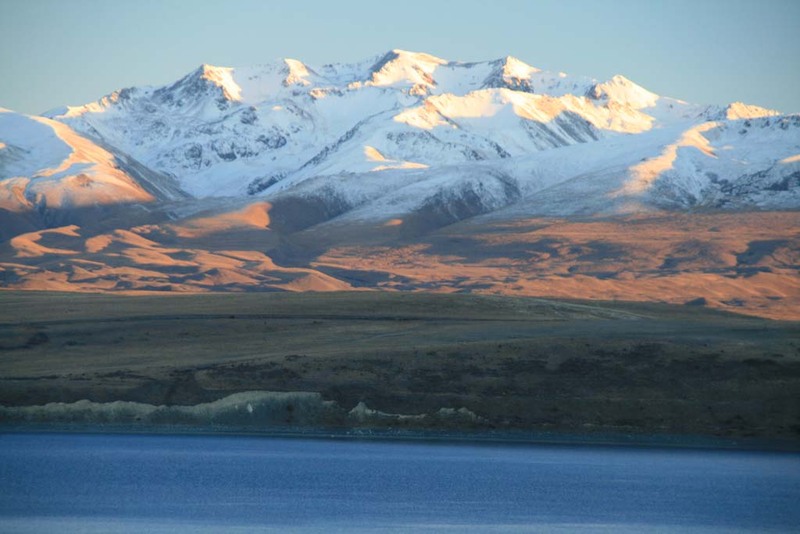 We arrived at Lake Hawea and stayed in the camping ground as we needed power for heating, very cold. The camp ground is ordinary and hot water is scarce but got the washing and drying all done so was grateful for that. A lot of Autumn colours are still around on some trees and laying on the ground, very pretty. The weather has turned wet and very cold, very low cloud so not much visibility. We spent the day catching up with other family members, people coming and going all day, perfect weather for just catching up. We got to bed at 9 pm, earliest in 3 days. A wonderful day. Queens birthday weekend in NZ today, looks like a fine day and we are heading off to Lake Matheson down the west coast, also looking in at the glaciers. When we got to Lake Matheson we did the walk right around as needed to find the best spot for early morning shots of the Mt Cook and Mt Tasman, if the clouds are king to us. The walk was 1 1/2 hours very pretty in the bush and the sounds of the birds. This is the track into the area we wanted to go, but we did it in the dark at 6 am, I had forgotten that the sun rose much later in NZ winter, we were up at 4 am cooking breakfast of bacon, sausages, eggs and toast as I knew it was going to be some time before we got back to the camper and in the cold you need heaps of fuel for the body to last the distance. It took us 45 min to do the walk in the dark, it was very steep tracks in places and in the bush area’s was slippery and finally we got to Reflection Island and waited patiently. This is what all the fuss was for, one is pretty lucky to get the clouds to move away and you need to be quick about it to capture the mountain. 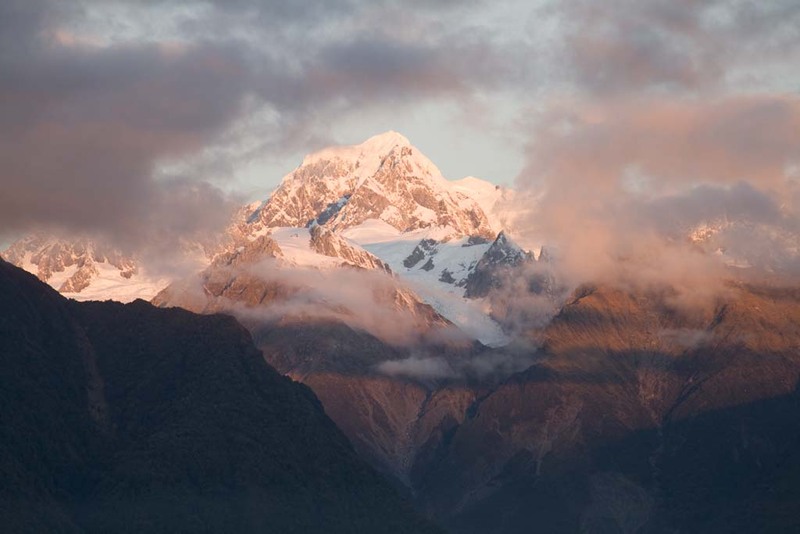 This is Mt Cook, Mt Tasman is in cloud to the right. This is the view we had on the return from our morning shoot. Fog as the sun tried to shine through the clouds, it was extremely cold at first light this morning but no wind so that was helpful. Posted in 2008, South Island & family in N.Z. 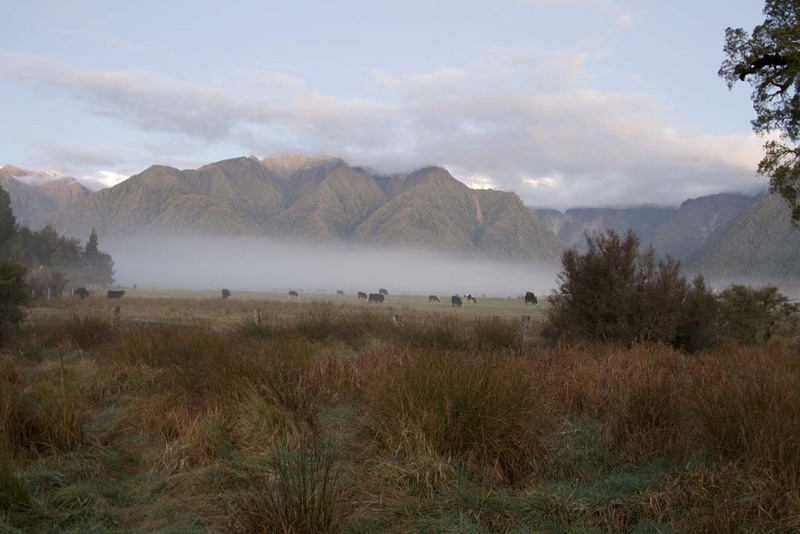 | Tagged Fog, Lake Matheson, Mt Cook, Queens birthday. 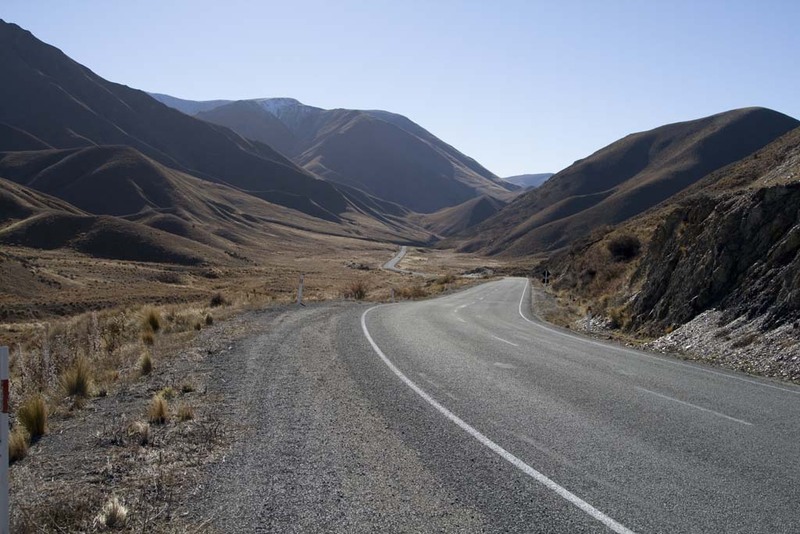 We are heading off and going over the Arthur ‘s Pass to the West Coast. 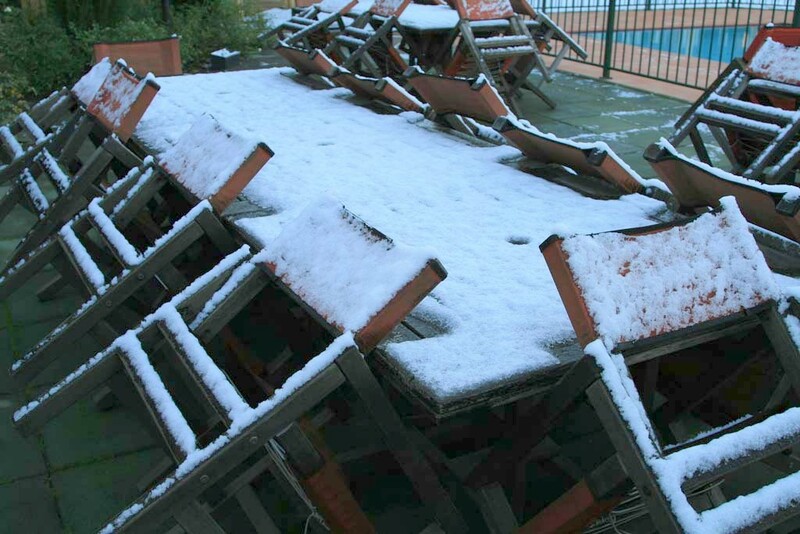 Left the family at 10 am our first sighting of snow on the Southern Alps was at Darfield. We made heaps of stops taking photo’s along the way, had lunch at Lake Pearson. We had just finished eating and packing everything away when I noticed the big storm clouds rolling in over the Alps from the West Coast, I knew from old that we better get moving, so we did just that. Got to Broken River and the road was closed for maintenance so we took photo’s from up the tops. 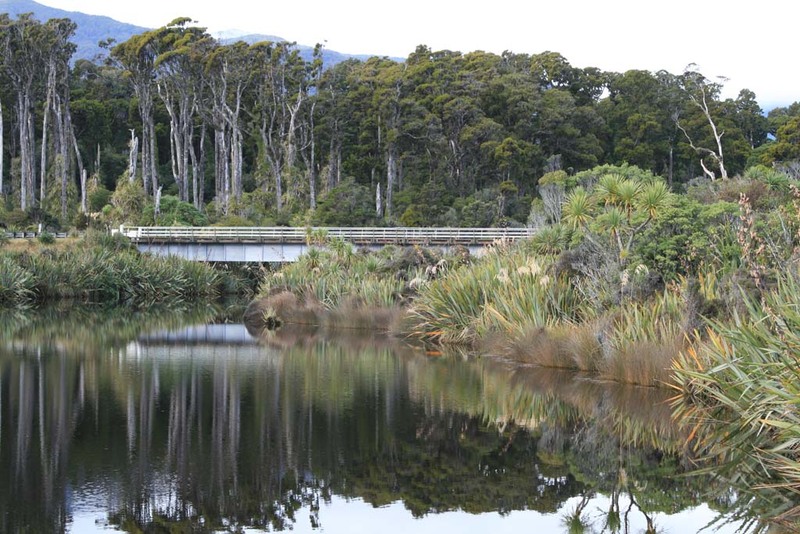 Just before Greymouth we turned off and headed for Hokitika where there was a family member having a 70th birthday. I had a Koru to pick up in at the Greenstone Center which I had made for me. We got to my family place at 4.15 pm. Caught up, chatting taking photos, the party went well and heaps of great stories were told of the good old hunting days from which we all did for many years, so many laughs and I think the heads on the deer get better every year. Such a good laugh. 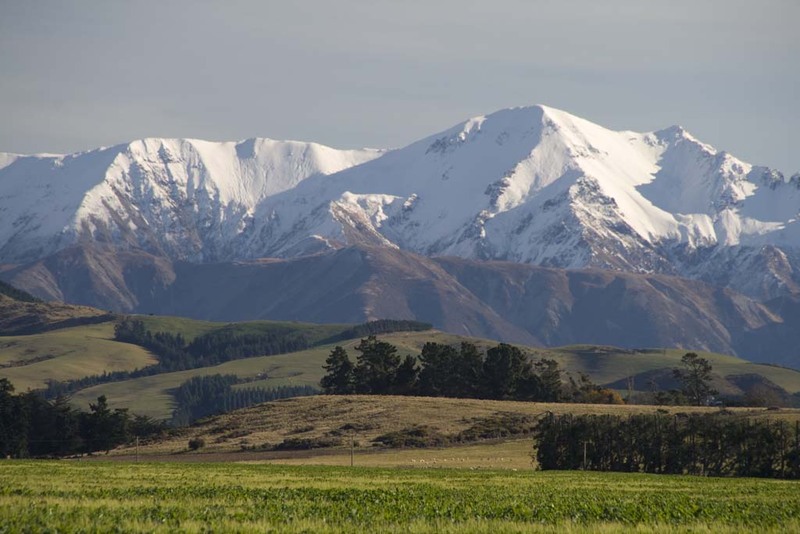 Taken from Darfield, so majestic are these Southern Alps. 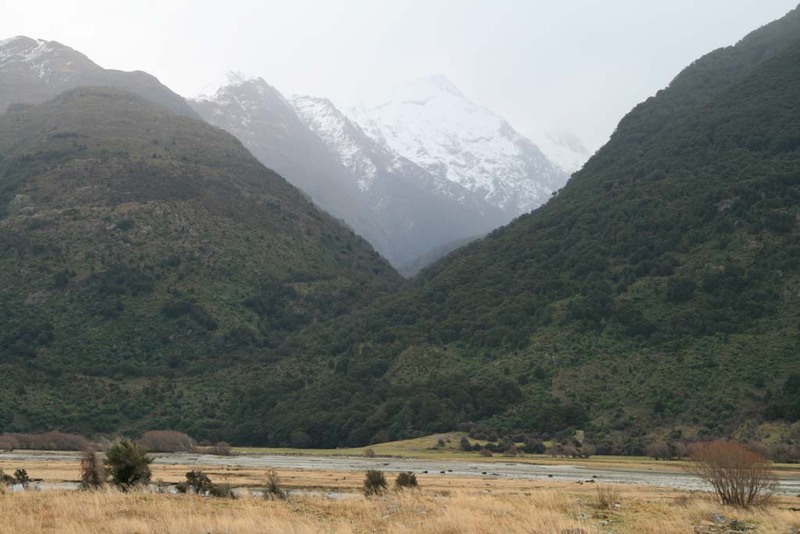 This is the Broken River area, some of the filming was done here for the Lord of the Rings I have been told. We got into Christchurch at 11 pm, very cold 1.1 deg, my cousin’s had been waiting for us since 10 pm, our plane was late leaving Brisbane. We went to my Aunties place and chattered until 1.30 am, so tired but so neat to catch up and see family members. Had a good nights sleep, up at 8.15 am it was still quiet dark, I’d forgotten how it is in winter, temperature was very cool 2.1 deg frost, we have a lot to do today, get the groceries and go over to pick up the campervan for our travels. Once the girls dropped us off at the Maui camper hire center we then did some looking around at Scarborough, Antigua boat sheds on the Avon, saw Shag Rock The Cave all very nice. Went back to my Auntie’s and we had a big gathering of Whanau ( family ) and got to bed late again, it was worth it so neat to see my Whanau. 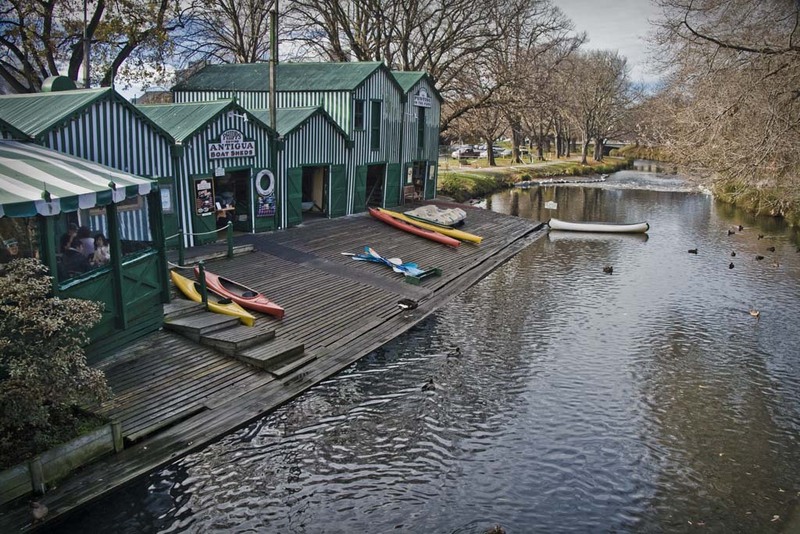 The top image is of the Antigua Boat Sheds, very well known in Christchurch on the Avon River, this river runs through the city. 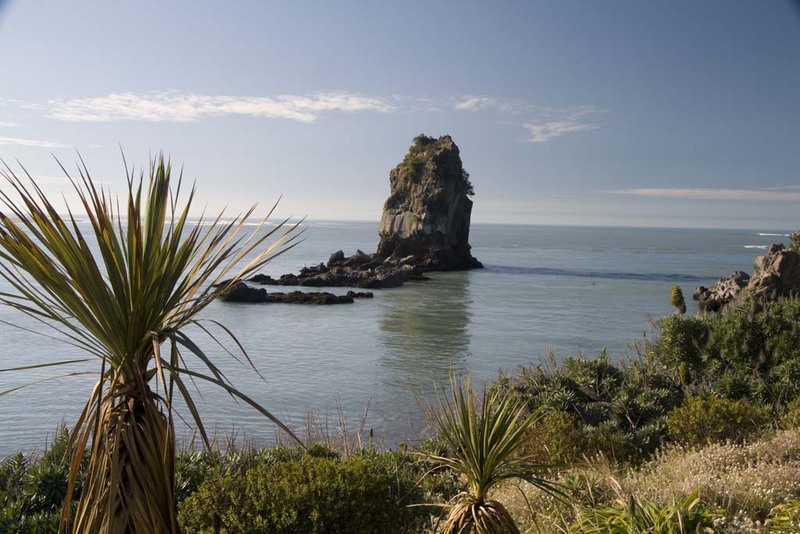 The second image is of the Shag Rock out form the peninsula at Scarborough Park and foot of the Port Hills.